Grozny ( Chechen regional tv ) , TRK Nadym ( general programming) , Perviy Kanal, Ohata & Rybalka (documentaries) all on Ku Band, Fixed 2 beam which although weak is available in the UK. For a long time there have been only the free channels on Hotbird from Russia, It is however possible to use the Express AM22 satellite, which is positioned for viewers in East Europe, with suitable dish , in the Uk. The main problem encountered is its low elevation, so it is very important to carry out a survey first before agreeing to install. If you are interested, please send me your map position ( latitude/longitude) first before emailing or phoning with detailed questions, go to www.satellitetveurope.co.uk/map5.html enter your post code and click “GO”. Then ‘drag n drop’ the red marker to your house . When completed a line of text appears below the map, containing your latitude and longitude , copy these numbers and paste into an email. I’ll have a look first using Google maps , to check if there is a clear line to the satellite, not blocked by buildings etc. The elevation of Express AM22 is very low, between 10.5 degrees ( Newcastle) , 11 degrees ( Derby) and 13.5 degrees(London), so low in fact that the standard sort of parabolic dish ( offset dish) looks like it is about to fall off! 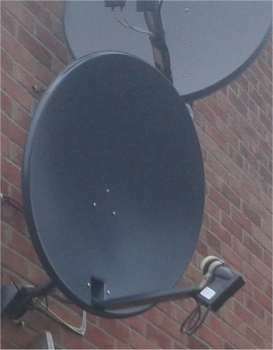 The picture of the dish being tested above also shows the relative angle between the dish above which is centred on Hotbird satellite ( 13 degrees East ) and the AM22 dish below ( 53 degrees east ) The Triax dish used has its lnb arm angled down to almost horizontal ! Nadym: News, general interest programming for the Nadym region of Russia.